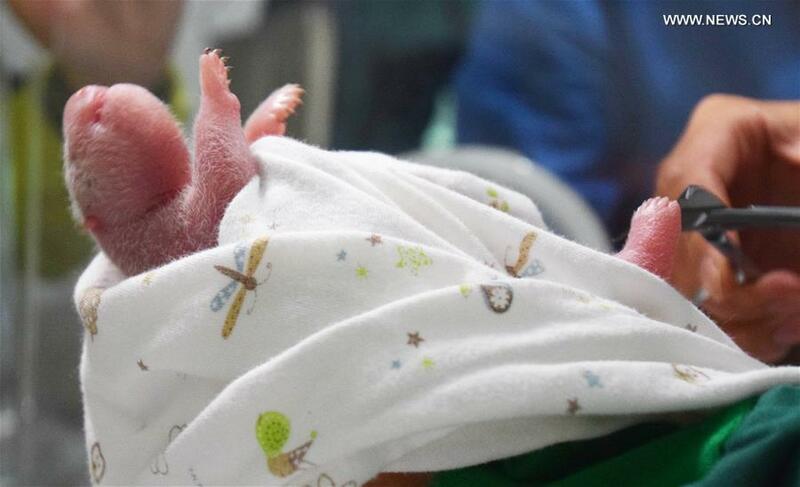 CHENGDU, Aug. 1 (Xinhua) -- The world's first giant panda cub with both captive and wild parents was born early Monday in southwest China's Sichuan Province. The cub marked success in experiments to encourage captive pandas to mate with wild pandas in order to increase the genetic diversity of the captive stock, according to Zhang Zhizhong, Communist Party of China chief of China Conservation and Research Center for the Giant Panda (CCRCGP). The 15-year-old female giant panda Cao Cao gave birth to the cub at 2:17 a.m. at the Hetaoping semi-wild training base. She started to show signs of pregnancy on July 1 and went into labour on July 30. The female cub weighed 216 grams, compared to the normal newborn wegiht of around 150 grams. Wu Daifu with the training base attributed the cub's unusually high weight to the good health and appetite of the mother during pregnancy. Wearing a positioning system and a recording device on her neck, Cao Cao, was released into the wild on March 1. She lived there for nearly two months. The recording device showed that Cao Cao went into heat on March 11 and mated with a wild male panda on March 23. The mating lasted for one minute and 30 seconds. Cao Cao was born in the wild and was rescued by the CCRCGP in 2003 at 2 years old. She has delivered six cubs in captivity, including two pairs of twins. For the most of the last seven years, she has lived at the Hetaoping training center, where she demonstrated strong adaptability to living in the wild. The CCRCGP launched an experiment in late 2016 to bring in genes from the wild population to make the captive pandas healthier. As of the end of last year, the worldwide captive giant panda population stood at 471, leading to growing concerns of inbreeding, Wu said. Zhang Hemin, deputy head of the center, said babies from captive and wild parents would enrich the gene pool of the captive stock.